A beautiful illustrated book, helping to show children how the little stories in the Bible make up the big story. The Biggest Story is a delight to the eyes, ears, and hearts of its readers. With rich illustrations and even richer text, the biggest and best story is presented in all of its vivid colors—every dark shade and every bright tone. Parent and child alike will feel the ache of the fallenness of human nature and the comfort of an always-faithful God. From our family to yours, we wholeheartedly commend this book! 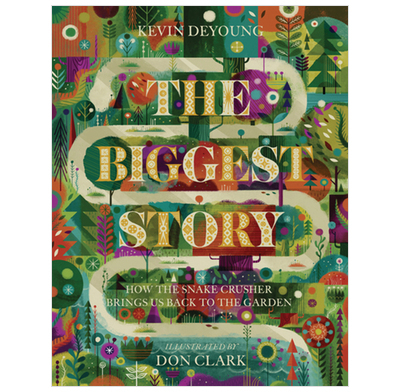 In The Biggest Story, Kevin DeYoung masterfully tells the story of man’s inability to be good enough and God’s enduring faithfulness to his promise to bring us back to paradise. This is the big picture, not the typical moralistic way of telling the Bible’s story. This book is engaging and wonderfully illustrated; your kids will want sit on your lap and have you read it again and again. I love what Kevin has done here! I’m buying a copy for each of my grandkids. I'm not your average children's book reader, but I am a faltering godfather and wannabe aesthete. So when I was on the hunt for something encouraging to buy my goddaughter I stumbled across this gem of a book, dutifully ordered her a copy and a sneaky extra one for myself. If we're going to judge a book by it's cover then this is fantastic book. To my eyes Don Clark has done a wonderful job. It's bright without being garish and certainly not twee. I love to the way he has carefully woven the themes of the story into the illustrations. Buy it. However if you're uncomfortable with a skin deep assessment then be reassured that the qualities of this book don't just please the eye. Judging this book by its content I found it comes up trumps again. Being no aficionado of Christian kids literature I've no idea how many books there are out there that attempt to show the coherence of God's salvation plan. I'm certain there are many good books that tell the individual stories that many of us cherish from childhood, but I personally don't recall being shown the whole story. Clearly this will disappoint those expecting an in depth Bible overview, but that's because it's for children! I think there is tonnes of value in standing back and simply telling the one story of our great God's work to redeem us, his creation, from our sin to bring us back to himself. Mr DeYoung & Mr Clark show us that the Bible, and history, has only one author, and his story is the most glorious one.